In today's post I will show you how to prepare skill matrix template in spreadsheet and quickly retrieve the data when you needed. You might already know what the skill matrix is. If you don't know - read this post. Read this to learn step by step how to develop template for skill matrix. To have all basic information in one table, you need to capture following data. 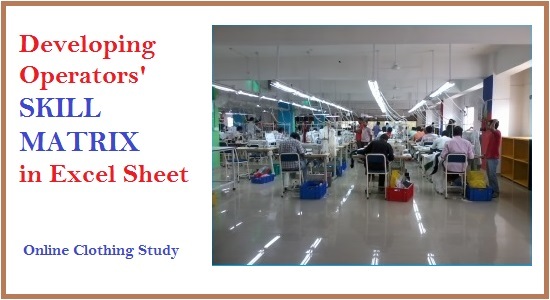 Sometimes you may be interested to have detailed analysis about operators’ performance, production quantity, style number on which operator has worked, number of hours she has worked etc. Capturing that much data manually and entering into computer is time consuming. Just for information one more data entry table is shown here (Table-2). You may capture all records of an operators but don't enter everything in the database. You will get lot of variation in her efficiency on different dates and different styles. This happens due to many reasons like having lost time, line setting, no feeding, working for few hours in a new operation, working on new style etc. Ignore abnormal data and only record best performance out of many different efficiency data against an operator. Also Read: How to calculation efficiency of individual operator? Instead of updating this table daily, you can update weekly interval or update when you see an operator doing a new operation or having good performance. (Though operators performance is depend on various things). If an operator is doing multiple operations in a same day, enter data in two rows to have her performance in all operations she has done. You can keep old record or replace old one with new record for an operator doing same operation. I have made pivot table to fetch data from the table (database) where you will be entering data. In the following section I have explained how to use excel templates for data entry and reviewing reports. First download excel template using this link (This is free download). In this sheet you will enter employee data with all required information. As said above you can modify earlier data of an employee by replacing it with new record. Or add a new record. Operator wise data: Select operator number for the drop down menu (See figure-2). You get list of operations done by that selected operator, list of machine type she had operated before and date when you have last updated her record. 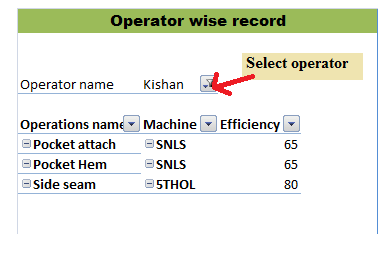 Operation wise data: Select operation name for the drop down menu (See Figure. 3). 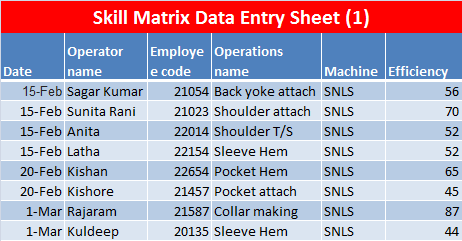 You will get list of employees who all did the selected operation (in the example operation: Sleeve hem), list of machine type she had operated before and date when you have last updated her record. Developing and maintaining skill matrix is a time consuming task. Still you have developed it once and update the same in weekly or monthly interval would be very helpful. Real time shop floor control systems have such feature to record operator skill history automatically. You might be using a different format for recording and viewing operator skills in you factory. However do you like this method? If yes please write you feedback on the following comment box. 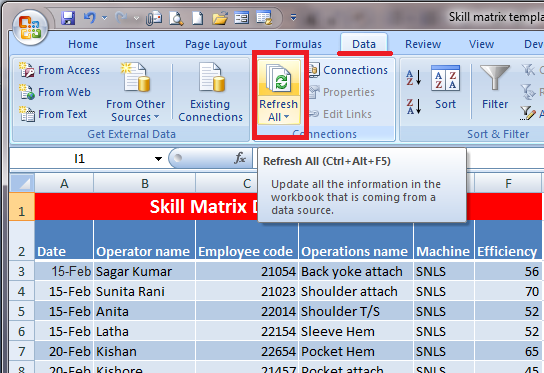 Operator skill matrix development in excel sheet.